4 Farms, 9 parcels, excellent soil types, one farm sytematically tiled. SHOWERS FAMILY TRUST-NORTH CENTRAL OH. Prime level cropland with excellent soils for agriculture, wooded land w/ mixed hardwoods, recreational wetlands, potential home & business sites. Auction Site: Sunny Acres Square Dance Barn @ 4600 Harding Hwy E. (SR 309) Caledonia, Ohio 43314, 6 mi. E. of Marion, 2 mi. E. of SR 98, 45 mi. N. of Columbus, 34 mi. W. of Mansfield, 9 mi. W. of Galion. Please call our office first to inspect the land. Location: Section 14, for GPS purposes only, at rear of 5049 Marion-Williamsport Rd. E.Caledonia, corner of Nesbitt Rd., 1 mi. S. of SR 309. Farm has been systematically tiled. Predominately Pewano, Blount silty soils. Total CRP annual payment on Tract 1 & 2, @ 276.47 per acre or $2.137.00 per yr.
TRACT #1: 48+/- total acres with 973’+/- road frontage on Marion-Williamsport Rd, 2679’+/- on Nesbitt Rd. with Muskrat ditch at rear, nearly all tillable acres of which approx. 2.32+/- acres is enrolled in CRP program along ditch. 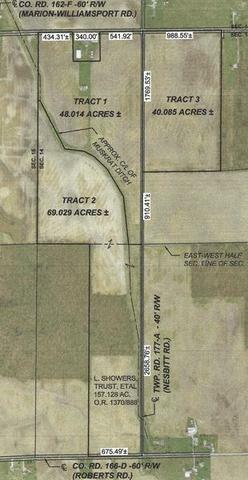 TRACT #2: 69+/- total acres with 2658’+/- road frontage on Nesbitt Rd., 675’+/- road frontage on Roberts Rd. with Muskrat Ditch on N. end, 59+/- total tillable acres of which approx. 5.41+/- acres is enrolled in CRP program along ditch, 9.19+/- acres of woods. TRACT #3: 40+/- total acres with 1769’+/- road frontage on Nesbitt Rd. and 988’+/- road frontage on Marion-Williamsport Rd. E., nearly all tillable productive acres. Location: Sections 9 & 10 approx. 1 ¼ mi. W. of Farm A on Marion-Williamsport Rd. E., plus road frontage and access off SR 309 and Marion-Galion Rd. Farm has Pewamo, Elliott, Muskego Muck & Whitaker loam soils. Productive farm acres, plus consideration for recreational/hunting value with marsh wetlands area. 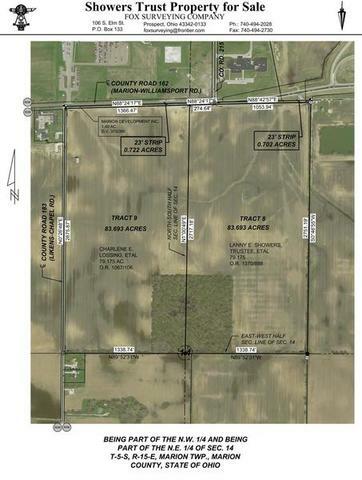 TRACT #4: 57.23+/- total acres with 1401’+/- road frontage on Marion-Williamsport Rd. E., 1544’+/- road frontage on SR 309, 45.54+/- tillable acres, 11.69+/- marsh wetlands. 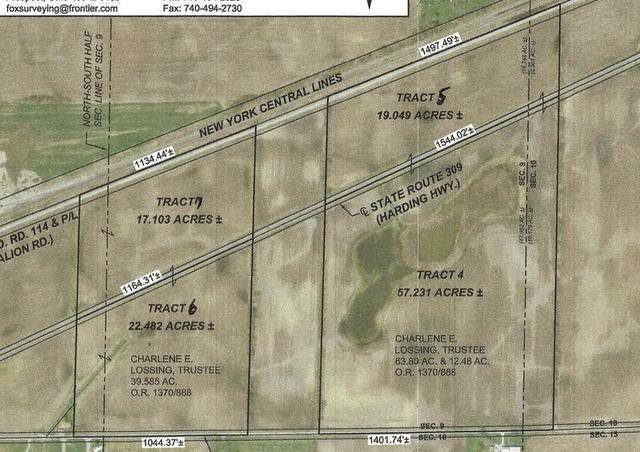 TRACT #5: 19+/- total acres with 1544’+/- road frontage on SR 309, 1497’+/- road frontage on Marion-Galion Rd., 16.196+/- tillable acres. Location: Section 9, just W. of Farm B or about 1/4 mi. E. of the intersections of SR 98, SR 309 & Marion-Williamsport Rd. E. Farm has Pewamo & Elliott Silty soil types. 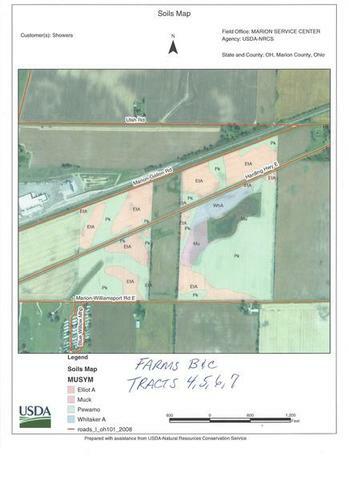 Productive farm acres, plus consideration for potential business opportunity land on State Hwy. TRACT #6: 22.48+/- total acres, with 1164’+/- road frontage on SR 309 E., 1044’+/- road frontage on Marion-Willamsport Rd. E., 20.98+/- tillable acres of which 1.35+/- is enrolled in CRP program @ $313.25 per acre, total payment of $423.00, along Ulsh ditch. 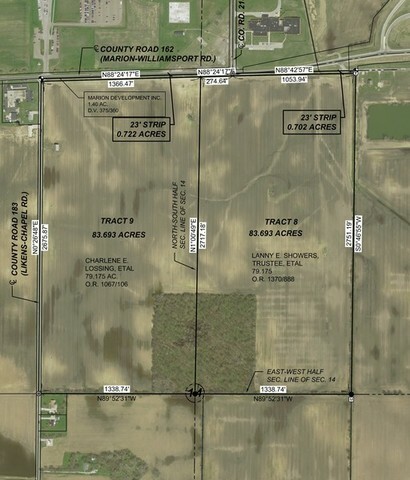 TRACT #7: 17.10+/- total acres with 1164’+/- road frontage on SR 309 E., 1134’+/- road frontage on Marion-Galion Rd., 15.42+/- tillable acres. Location: Section 14, at corner of Marion-Willamsport and Likens Chapel Rds. Marion, Oh. just E. of Marion Co. Sheriff Dept. and Marion Correctional Institution, or just W. of SR 23 and Marion-Williamsport Rd. interchange. Farm has predominately Pewamo and Blount soil types. Productive farm with business location potential just off SR 23, wooded recreational/hunting wooded value or possible homesites. TRACT #8: 84.395+/- total acres, 1328.58’+/- road frontage on Marion-Williamsport Rd. E., 72.26+/- tillable acres of which 1.17+/- ac. enrolled in CRP program @ $313.25 per ac./total payment $367.00. 6.9+/- acres in woods. TRACT #9: 84.415+/- total acres, 2675’+/- road frontage on Likens Chapel , 1366.47’+/- road frontage on Marion-Williamsport Roads. 74.85+/- tillable acres, balance w/vintage barn & woods. BIDDER NOTICE: We will be using the multi parcel auction method. 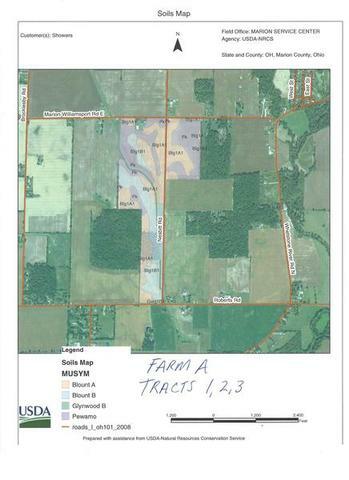 Tracts 1 thru 9 to be offered individually in combination or as a whole 431+/- acre farm. Selling in the manner that brings the most money. All bids will compete and remain open for bid advancement until auctioneer announces property sold. DISCLAIMER: Information contained in this brochure and all related materials is based upon information available at time of listing and are believed to be accurate, but is subject to verifications by all parties relying on it. No liability for its accuracy, errors or omissions is assumed by the sellers or Auction Company. Tract acreage, dimensions, aerial photos and boundaries are approx. and are taken from Co. & FSA Agency records. The potential Buyers hereby stipulate and agree that they have examined the property. Relying solely upon such examination with reference to conditions, Buyers agree to take such property “AS IS” without any expressed or implied warranties by Seller or Seller’s agent. Any inspections desired by the Buyer shall be prior to the auction at Buyer’s expense.